I have long lamented that the industry that has needed to embrace the Experience Economy more than any other is the one industry that has rarely hired me: retail. There is such a crying need out there for engaging, memorable, personal retail experiences – and simultaneously such a dearth of them. It’s no wonder the phrase “retail apocalypse” has gained such currency, with over 300,000 results for that exact phrase on Google and its own entry on Wikipedia. So over the past year or so I’ve been doing my part to get retailers to understand how very important retail experiences are to their businesses, to their hope of surviving this Retail Apocalypse. 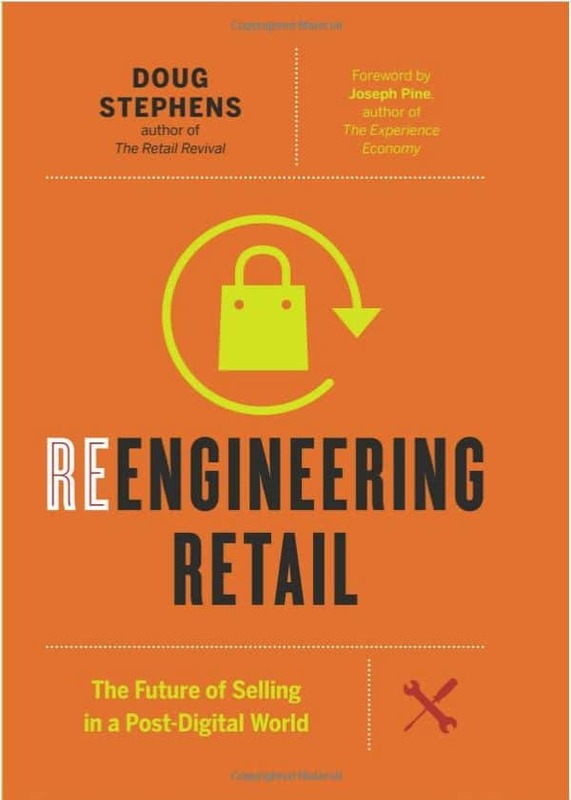 I’ve written more articles (including one whitepaper), handled more interviews, and even penned one book foreword specifically on retail experiences than at any other time in my 25-year writing career. This Thoughts post is a summary of these writings that span the year 2017 (give and take a month or two). Even if you’re not a retailer, I guarantee you will learn an immense amount about how to stage engaging, memorable, personal experiences for your customers in a short amount of time. But if you are a retailer, please, please, please read, read, read!!! You owe it to your company, your employees, and your customers to embrace the principles of the Experience Economy to stage (yes) engaging, memorable, and personal retail experiences. BoF named it one of the “Top 10 Op-Eds” of the year, those which “sparked the most debate, yielded the biggest insights, and got the fashion industry talking”. If that phrase doesn’t mean anything to you, that’s because it’s in Dutch! 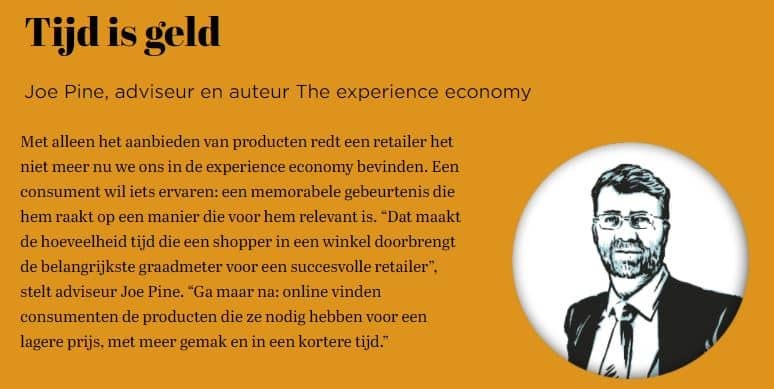 It’s actually the rather familiar phrase “Time is money”, which was the focus of this article in RetailTrends magazine from (naturally) the Netherlands. The magazine had a special focus on the trends that were impacting retail sector in 2017 and asked me to weigh in. My contribution was focused on one point: the time a shopper spends in a store is the most important indicator of success for a stager of retail experiences. The key example I used is one of my favorite retail experiences in the entire world, P.G.C. Hajenius, a cigar shop in the center of Amsterdam. First of all, the place exudes authenticity – this cigar lover’s heartbeat immediately slows on entering the store, so at home is he. It further lets one experience its cigar and pipe offerings (no cigarettes! No magazines!! No lottery tickets!!!) right in the store, not just as they are beautifully displayed but by smoking them there in its own cafe. The more time one spent there, the more money one spends there! And further to this point, that time is money, twice a week Hajenius stages an admission-feed experience in its back boardroom, where people pay €35 for an educational cigar-smoking class, with a cigar itself subsumed within the experience for free! You will see me return to again and again to this topic of in-store admission-feed experiences in this Year of Retail Experiences. To summarize this piece, I would simply reverse the title: experience is about placemaking! If you want to stage great retail experiences, you must become placemakers, turning your generic space into particular places that engage consumers and come off as authentic to them. It highlights what I think is the best, most experiential, authenticity-rendering shopping mall in the world: Jinli Street in Chengdu, China. The first time I went there a decade ago, the group I was with (the only Caucasians we saw in the entire place!) walked under the giant gate that demarcated it from the rest of the dingy city around us and seemed to be transported into the past. The street was lined with a tea house, restaurant, hotel, a shrine with contemplative gardens, and shops – numerous shops, every single one filled with artisans not only selling but generally making their crafts right there in the store. We partook in a host of cultural experiences that night, beginning with ceremonial tea, proceeding to a Sichuan dinner, then a stroll in the gardens and through the shops, with every one of us buying some handcrafted item or two (and in several cases more) by which to remember both Jinli and our experience. So great was the experience, and so authentic did it seem, that most all of us have been back again and sometimes again to this wonderful place. And yet, one of the translations of the two Chinese characters jin and li is “fantasyland”. That is the essence of rendering authenticity, a key component of placemaking. While it must be experienced to be fully appreciated – and I know that’s not easily done! – do read my interview in 3RD4ALL to learn from the best. To complete this triptych of Dutch pieces, “Your Competition? The World” was published in Shopping Centre News in March 2017 (also in English). Building on the principle introduced above that time is money, this piece asserts that no matter what business you think you are in, because of the rise of today’s Experience Economy you now compete against the world. You may think your competition is only with other retailers, or only with other companies in your geographic area, but in fact, you compete with every other company in the world for the time, attention, and money of individual consumers. There is a reason we use the verb “spend” with each of these three nouns, for they are the currencies of the Experience Economy. The experience is the marketing! And note that time is limited, attention is scarce, and money is consumable. Therefore, you need to understand a fundamental principle of the Experience Economy: the experience is the marketing! The best way to generate demand for your retail stores – the mission of marketing – is to create an experience that is so engaging that consumers cannot help but spend time with you, give you their attention, and then buy your merchandise as a result. You must, therefore, create and stage marketing experiences – experiences that do the job of marketing by generating demand for your merchandise. 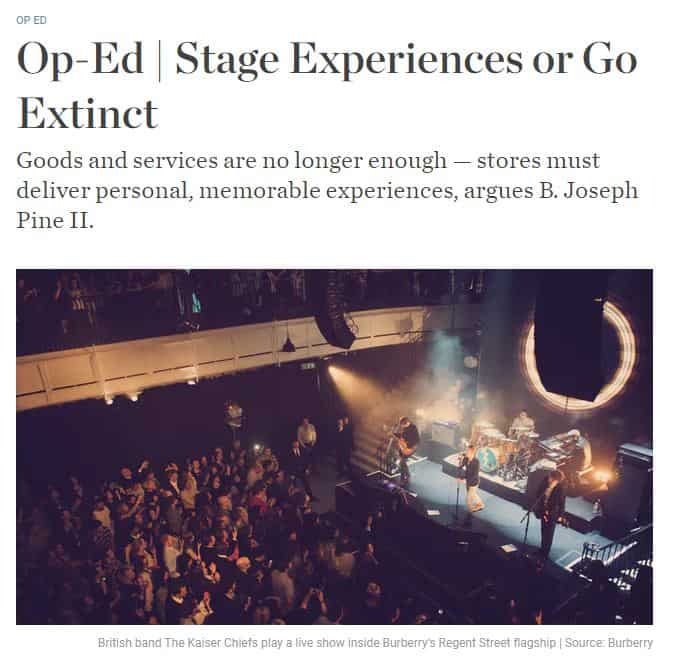 After numerous examples of retailers that do stage such marketing experiences within their stores, this article closes by saying that, whether you are a mall developer or retailer, recognize that you face a stark choice. You can either keep doing the same things that your industry has always done and slide down the slippery slope of commoditization, or you too can shift into the Experience Economy and create places in which people want to spend their time, give you their attention, and then pay you for the merchandise that they experienced themselves – and perhaps even pay for an admission or membership fee into your engaging, memorable experience. This is by far the longest and also the most academic of the pieces in this collection on retail experiences, but if you only read one article here, this is the one: “Distinctive Experiences” from the inaugural issue of the Journal of Shopper Research. Today we are in an Experience Economy where goods and services are no longer enough; what consumers want are experiences – memorable events that engage each individual in an inherently personal way. But in the two scant decades, since we first wrote about this natural economic progression beyond the Agrarian, Industrial, and Service Economies, the focus on economic experiences has already been diluted by other concepts that have arisen in its wake. Most notable among these is the “Customer Experience” movement, generally abbreviated CX, which aims to make interactions with customers nice, easy, and convenient. These are all well and good attributes, but they characterize services, not experiences, and are themselves easily copied. Retailers must resist the siren call of CX and learn to stage the truly distinctive experiences consumers desire, lest they be commoditized. By reading it you will learn the true distinctions between each of these economic offerings as well as the different arenas in which companies are using experiences in their businesses, and you will gain insight from quite a number of examples of retail experiences. And most importantly, you will understand why it is, in fact, important to resist that siren call of CX and stage the truly distinctive experiences consumers desire today – retail experiences that are engaging, memorable, and personal. And perhaps those should be multiplication, not addition, signs! You cannot hope to avoid the consequences of this formula – unless you shift up into the Experience Economy. What If Stores Charged Admission? A second Op-Ed on the Business of Fashion website, in August 2017, asked a question that may be startling to most retailers: “What If Stores Charged Admission?” This issue has actually been addressed a few other times in the articles above because it relates directly to the issue of time. For as I write there, consumers can save vast amounts of time by getting anything they want over the internet; they no longer need to visit physical stores to satisfy their material needs. Increasingly, the sole reason for going to a store is the experience: because consumers actually value the time they spend in the store and view it as time well spent. And there’s only one absolutely foolproof way to know that customers view an experience as time well spent: they’re willing to pay for it. For stores, this means charging admission or a membership fee. That may sound crazy, but it is simply the natural consequence of understanding that if you stage retail experiences, then it is the time customers spend with you that they value. And eventually, you have to align what you charge for with what they value! That’s why you would never imagine going to a movie, concert, play, sporting event, or theme park and not pay admission – you know they’re experiences and so, of course, they charge for time. 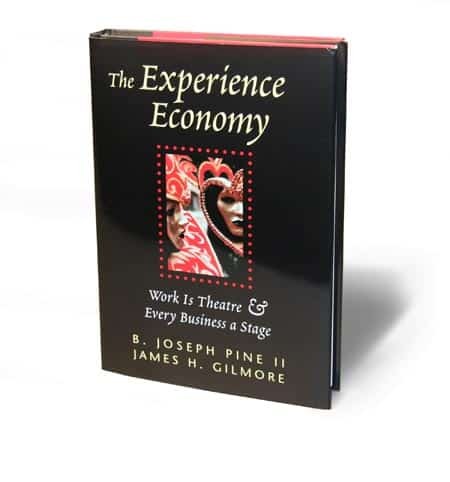 When my partner Jim and I first made that point in the first edition of our book The Experience Economy way back in 1999 (still available at Amazon in the original hardcover, but if you’re going to buy it, get the Updated Edition), we could only point to a very few number of retailers charging admission for their places, or experiences within their places. Now there are scores (one of which I already mentioned: P.G.C. Hajenius in Amsterdam). In this BoF Op-Ed, I highlight what are now my two favorite examples, Ziferblat and Wingtip. The former is a small chain of coffee shops Café in the United Kingdom where you sign in when you enter and pay eight pence per minute for the time you spend there — and the coffee is free! The latter is a men’s store in San Francisco that created a 13,000-square-foot club in the top two floor of its building where it charges members up to $200 per month for access to a common bar and eating area, private dining rooms, wine lockers, a golf simulator, billiards room, boardroom and roof deck. While all the principles I’ve written or talked about in these articles apply just as much to retail websites as they do to retail stores (including charging admission! ), their application is of course very different. So if you are an internet-only based retailer or otherwise want to enhance your online retail experiences, then you need to read this whitepaper published by my client RichRelevance, the “world’s leading personalization provider”, as its website attests. The company engaged me to help it think about how to expand the possibilities for its offerings that help customers better personalize their websites – not just product recommendations but content, chatbot responses, and what and how the formatting of pages morph themselves to particular users. 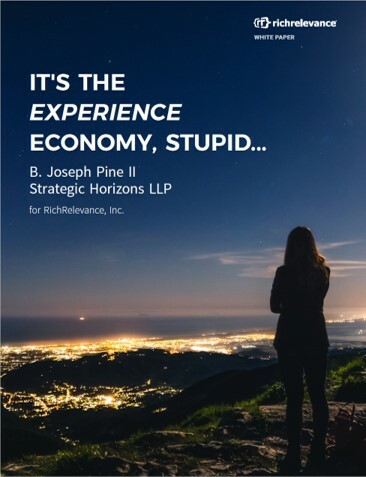 And now RichRelevance has begun a strategic personalization initiative it calls “Experience Personalization”, and my whitepaper, “It’s the Experience Economy, Stupid…”, sets the stage for thinking about how to personalize your website to each and every individual visitor (and, oh, by the way, all of the concepts and even the technology can apply in physical retail experiences). While you will read much in the setup of this whitepaper that is similar to the other articles here, the main thrust is a focus on the individual. A customer is not a market, nor a segment, nor a niche, nor a persona, nor a generation, nor any other agglomeration of anonymous buying units of indeterminate size. . . . To be customer-centric, then, you must think about, understand, and interact not with so-called markets – get over it, they don’t really exist! – but with the individual customers who are the only ones who ever buy what you offer. Think of it not as marketing – pushing messages out to targets in order to better sell what we’ve already produced – but as customering – talking with each individual, living, breathing customer in order to pull what they want and need at this moment in time and then get that information back into operations to fulfill those exact desires. Of course, in today’s business environment you still have the co-equal imperative to do so with low-cost, high-volume, efficient operations, so, therefore, you must mass customize your offerings to each individual customer. . . . Anything that can be digitized can be customized. The rise of digital technology has enabled the ability to fulfill the promise of personal experiences that go beyond just providing goods and services. One of the most vital characteristics of digital technology to appreciate is that anything that can be digitized can be customized. Once it enters the realms of zeroes and ones, you can instantaneously change a zero to a one and vice versa. So the explosion of digitization means we can now stage experiences customized to each individual. And all these experiences work together, synergistically weaving together core offerings and enticing experiences into a demand-generating dance. That dance is how to think about your physical places and online sites working together as one, staging retail experiences for each of your individual customers. This article, commissioned by the Harvard Business Review specifically to address the issue of why so many retailers are failing today, is the capstone in this series. As such, the focus of “Shoppers Need a Reason to Go to Your Store – Other Than Buying Stuff” is once again about time. For all retailers face a stark choice today: they can focus on time well saved – the province of most every online retailer, with capabilities incredibly hard for most physical retailers to match – or on time well spent – to offer an experience so engaging that customers cannot help but spend time with you! And again, the more time they spend with you, the more money they will spend. With numerous examples – including many more that do actually charge admission for the experience, plus what I think is the best new retail format in ages: Eataly – the fundamental point is that physical retailers must choose between time-well-saved and time-well-spent strategies. Whatever you do, you should be careful not to choose a middle-of-the-road approach that fails to excel at either. To conclude this tour through a Year of Retail Experiences: if you as a retailer do decide to go for time well spent by staging engaging, memorable, and personal retail experiences, have I got some ideas for you. . . .
Hi Joe, Nice, insightful compilation of arguments and advantages to making retail a valued experience. There is a line customers determine between overhype and real value. One known example of overhype may be the environment at Comdex where entertainment happens almost at every few steps. The experience I helped create was to create an outstanding credibility experience where customers were making major decisions on network technology investments. We held it in Comdex basement and it was standing room only by CEO’s and CTO’s to hear the top experts in network technology share their views of the future and which solutions are the best and why. Novell and HP prospered hugely by setting the stage for a high credibility experience. While many of HP’s strict blue-suite wearing upper management affectionately remind me that their closet used to be 12-15 dark blue suits; now filled with kings, lion tamers, and Indian Jones type costumes, they smiled when recalling their experience elevating what was usually standard (boring) presentations to a far higher level experience. I love good theatre but also see how customized experiences also offer great value. When my sales team was doing 16 city customer and then reseller new product tours, we always made it fun. When we were introducing a new range of color products, we asked resellers to dress as colorful as they could imagine. Puerto Rico beat out Miami but all 16 cities went way out. Today, I look at experience as a key part of the way values are shaped in this new, sort of weconomy and as part of how ecosystems form trust, credibility, delight and relevance. It’s all about people and the need for greater business humanity. While I was also a trained creative talent, I still remember how our large agency was taken back when I asked them to ask people outside the creative profession for ideas. The Creative Director and Art Director were taken back as they saw that as their job. But a true talent listens for the seeds of ideas from markets that internalize some parts of a value well before companies deliver it. That ability to synthesize the impact of change and even digital transformation on work, life and communities. I support your great experience in helping people see and act on this, while empathizing with your retailer resistance to take on doing this when more who experience it can verify it mattered. Also I hope to re-engage with you if I can get traction on this rather large experiential engine I am helping to shape for a major movement in the making because experience and value are the two strongest assets across this personal, corporate and community interdependent ecosystem. Please note: I expect to finally redo my website later this month after ignoring it for three. Your suggestion to just engage leaders directly has shown much promise as human to human experiences (sans the cell phone) are still an art form and as such, a real value when it too is a thoughtful experience. Keep up the great work Joe.